This is the oldest vehicle to date to appear on the Old Bus Photos website and what a shot it is, it was contributed by Robert Gomersall who is the great grandson of R Taylor who was the original proprietor of Ideal Service. They had three other Graham-Dodge vehicles in their fleet all delivered between 1925 and 1927, one other 20 seater and two 14 seaters. 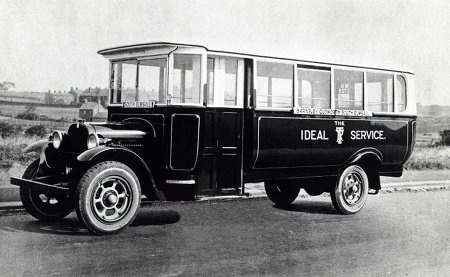 The two 14 seaters did not stay long both being sold on by 1929 this particular bus was sold to Oscroft of Goldthorpe in July 1933 and the other 20 seater was scrapped in 1935. The body was built by Reynolds of Barnsley of whom I know very little, any information would be gratefully received. Below just for reference are enlargements of the front and side destination boards. In 1920, Dodge Brothers emerged as a leading builder of light trucks. Dodge Brothers cars ranked second place in American sales in 1920. Then both brothers died and the company started to stagnate. To help, Dodge entered into an agreement, whereby they marketed trucks built by Graham Brothers of Evansville, Indiana through their dealerships. [The three Graham brothers would later produce Graham-Paige and Graham Automobiles]. The Graham brothers, Joseph, Robert, and Ray, had began building trucks immediately after World War I, teaming up with Dodge Brothers in 1921 after the deaths of John and Horace Dodge in 1920. The Graham truck became the Dodge truck. In the end, having fallen to fifth place in sales, Dodge fell to Chrysler in 1925. However, these trucks continued to be marketed until 1929. Stratford Blue appear to have taken delivery of a couple in 1930 with unknown B14 bus bodies. My thanks to Neville Mercer and Chris Hebbron for the Ideal Service fleet history and the Dodge-Graham history. It never ceases to amaze me of the variety of chassis and body builders around at that time. Chassis makers imported their products from all over Europe. They would never all have made it, but the 1929 ‘Crash’ prematurely finished a lot of them off. I’d say that Gilford (with their unique Gruss front suspension and own Wycombe bodies) was, perhaps, the most popular of these outsiders, specialising more with coaches rather than buses. They managed to get through the recession, but the big boys dominated the market by then and there were fewer independents, so, despite their making a very good and reliable product, they went into liquidation end-1936. Funny you should mention Gilford. A great "might have been" manufacturer. By all accounts a superb product hit both by the crash and by that old devil – consolidation. There were faithful customers who were taken over by other firms – or even groups – and were not Gilford customers. Overnight a customer base would disappear. [This happened a lot with post deregulation grouping and regrouping.] Unfortunately, it happened too often with Gilford who were also very much in to advanced experimental models which cost a lot too develop and cost too much for conservative operators to buy. Satisfied customers included Bristol Greyhound, Black and White and Yelloway.